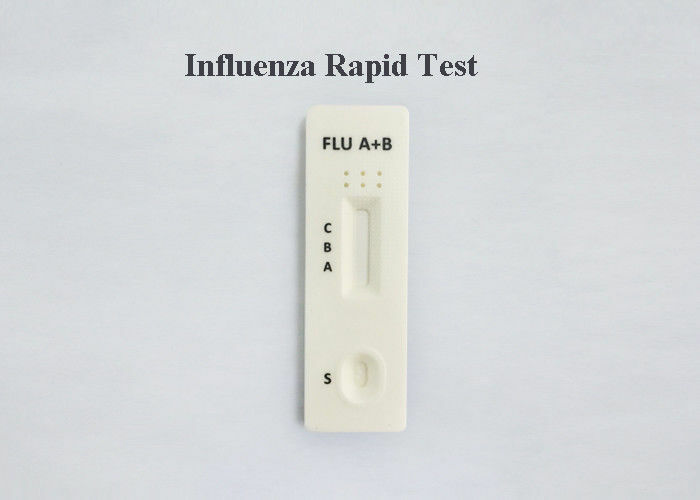 The Influenza A Rapid Test is an in vitro diagnostic test for the qualitative detection of influenza type A nucleoprotein antigens in nasopharyngeal swab and nasal aspirate samples, using the rapid immunochromatographic immunochromatographic method. The identification is based on the monoclonal antibodies specific for the nucleoprotein of Influenza virus A. 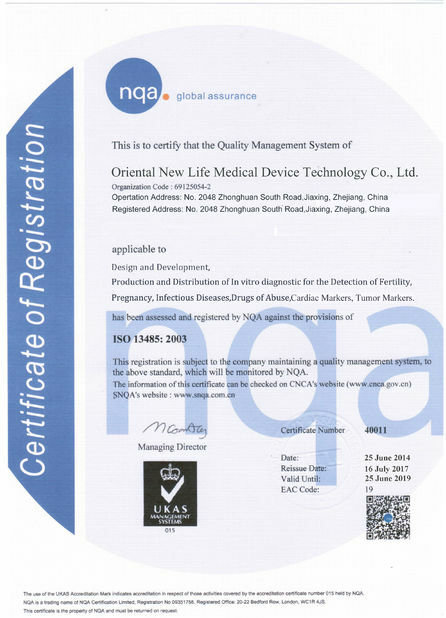 It will provide information for clinical doctors to prescribe correct medications. Negative results should be confirmed by other methods, such as cell culture. 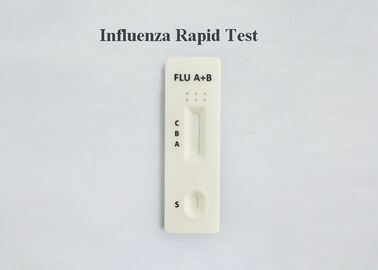 The Influenza A Rapid Test Cassette (Swab/Nasal Aspirate) is a qualitative, lateral flow immunoassay for the detection of Influenza A nucleoproteins in nasopharyngeal swab, throat swab or nasal aspirate specimens. 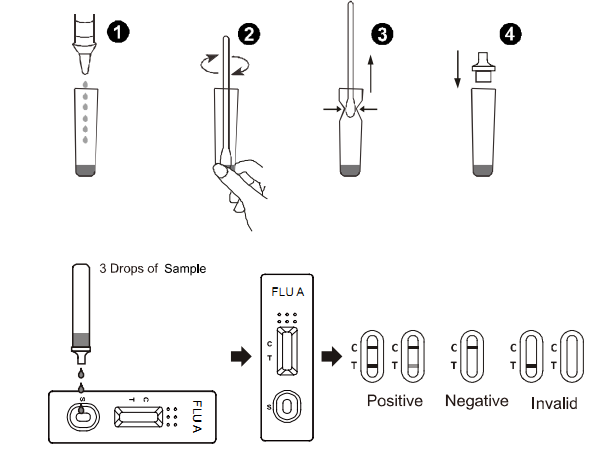 In this test, antibody specific to the Influenza A nucleoproteins is separately coated on the test line regions of the test cassette. During testing, the extracted specimen reacts with the antibody to Influenza A that are coated onto particles. The mixture migrates up the membrane to react with the antibody to Influenza A on the membrane and generate one colored lines in the test regions. The presence of this colored line in either or both of the test regions indicates a positive result. To serve as a procedural control, a colored line will always appear in the control region if the test has performed properly. Allow the test, specimen, extraction buffer to equilibrate to room temperature (15-30°C) prior to testing. Remove the test cassette from the sealed foil pouch and use it as soon as possible. Best results will be obtained if the assay is performed immediately after opening the foil pouch. Place the Extraction Tube in the workstation. Hold the extraction reagent bottle upside down vertically. Squeeze the bottle and let the solution drop into the extraction tube freely without touching the edge of the tube. Add 10 drops of solution (Approx. 400μl) to the Extraction Tube. See illustration 1. Place the swab specimen in the Extraction Tube. Rotate the swab for approximately 10 seconds while pressing the head against the inside of the tube to release the antigen in the swab. See illustration 2. Remove the swab while squeezing the swab head against the inside of the Extraction Tube as you remove it to expel as much liquid as possible from the swab. Discard the swab in accordance with your biohazard waste disposal protocol. See illustration 3. Add three drops of the solution (approx.120μl) to the sample well and then start the timer. Read the result at 15 minutes. Do not interpret the result after 20 minutes. 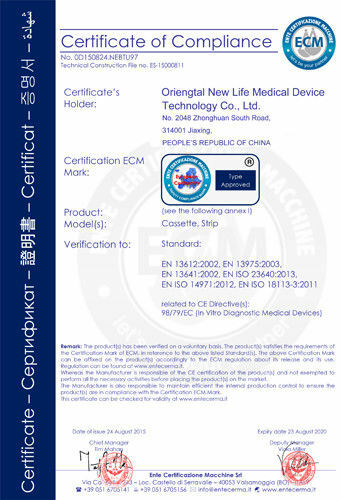 Caution: The above interpreting time is based on room temperature range of 15-30℃. If your room temperature is significantly lower than 15℃, then the interpreting time should be properly increased to 30 minutes. weaker or darker than that of the control line. This still means a positive result. The control line appears in the result window, but the test line is not visible. If the control line does not appear in the result window, the test results are INVALID regardless of the presence or absence of the line in the test region. Detection Range:Minimal detection limit for Flu A is 3.0×104 TCID50 / Test.